Setting up an online store, or expanding your existing business into selling your products online is not really that difficult, however, it is also an aspect that is frequently oversimplified and not researched well enough. Small businesses can actually be successful and even have an edge over the bigger online retailers. The key is in knowing and understanding the entire online process from start to finish as well as providing excellent customer service. Many people completely ignore the fact that they still need to learn how to operate the system and learn the application inside out. It’s like buying any other piece of software (MS Word, Photoshop, etc.) and thinking that the software will just generate sales by itself. Of course it won’t! You still need to learn how to set up your products, add special offers, change pricing, descriptions, keep track of inventory, optimize it for Search Engines, understand how the payment transactions work, and overall, take full advantage of all the features and options that come included with your particular application. No matter what type of product you sell and how many other e-Commerce retailers seem to dominate the online shopping arena, the truth is that e-Commerce is just getting started and there is still a lot of room to grow. Consider that in Europe, only about 10% of people buy products online and the number keeps growing every year. Target Average Orders Between $50 and $200. This is really related to number 4 above. If you have a real thin profit margin below 20-25%, you will have a difficult time allocating the proper budget to advertise and promote your store. At the very least, you will want to use Google AdWords to promote your products online in addition to other online and Social Media channels. You will absolutely need to drive traffic to your store and driving traffic will cost you money. Plan for it and add it to your Income/Expense projections. See number 10 below. This is very important and often not very glamorous, but there are literally thousands of products that are just not available at your local shopping mall, yet customers will need and want to buy as soon as they find them. Niche product + Search Engine results + affordable price + video marketing = satisfied customer. If you’re serious about selling products online, you will need to have a team dedicated to handle your online presence. At the very least, you should have a technical person with programming background, and a marketing person with e-Commerce experience. Although modern shopping cart platforms are relatively easy to use, once you start getting into custom modifications, things can start to get a bit complicated. The difference between an average online shopping cart and a GREAT and profitable online shopping cart is how much you’re able to modify it to meet yours and your customers’ needs. Yes, you will need to advertise your online store. You may develop the most beautiful online store on the Internet, but the truth is that it will be very hard to actually create a profitable and growing e-commerce business unless you have a decent budget to buy advertising. You would think that once you have your own website you will attract lots of new customers but the reality is that customers are not really looking for you. You will need to look for them. Search Engine optimization, PPC campaigns, Social Media promotions, and overall, website and e-Commerce development and maintenance are expensive and time consuming. 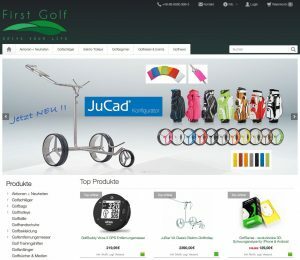 Under the name of our second company First Golf Business Club GmbH we manage the online shop First Golf – Drive Your Life to sell all kinds of golf products. We are happy to give you the experience we get by offering this shop since 2008.